“`Mrs. Bush was born Barbara Pierce in Rye, New York. She was a distant relative of President Franklin Pierce. Her father was a publisher of McCall’s and Redbook magazines. After going to Smith College for two years, Barbara married young naval aviator George H.W. Bush. She was 19. Mrs. Bush raised five children; a sixth dying from leukemia when she was three. “`After World War II, the Bush’s traveled to Texas oil fields to seek their fortune, and raise a family. The elder Bush began his civic journey, and he represented Houston for two terms in Congress in the 1960s and the 1970s. They made almost thirty moves before his election to the White House in 1989. Barbara kept all opinions from the public, while her partner was in office. She deviated with him on two issues; Barbara supported legal abortion, and opposed the sale of assault weapons. Promoting literacy was her passion. “`In 1990, Mrs. Bush gave the commencement address at the all-women Wellesley College. Some protested her choice, because she was considered prominent through the achievements of her husband. Her address was ranked by a survey of scholars in 1999: One of the Top 100 speeches of the century. “`When her husband was defeated by Bill Clinton after the 1992 campaign, the couple’s final move was to Houston; with a summer home in Kennebunkport, Maine. Eight years later, Mrs. Bush stood with her spouse as their son George W. was sworn in as president. They returned when he won a second term. Unlike Mrs. Bush, Abigail Adams died in 1818, five years before John Quincy Adams was elected chief executive (and six years before his inauguration). “`Upon retiring, the Bush couple helped raise millions for various charities, and they appeared together at events, such as Houston Astros baseball games. Over the decades, Barbara was a steadfast supporter of her sons in politics. Public schools in the Houston-area are dedicated to both. She definitely maintained 500 of a 1000 points of light in the Bush partnership. “`President Donald Trump has ordered United States flags to be flown at half-staff. Mrs. Bush will lie in repose from noon to midnight on Friday at St. Martin’s Episcopal Church for the public wishing to pay their respects. 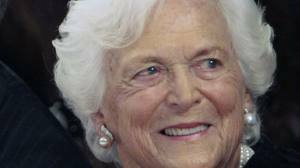 Private funeral services for Barbara Bush are planned for Saturday at the church in Houston, which she and her husband regularly attended, according to the George Bush Presidential Library Foundation website. “`She will be buried near the Bush Library grounds at Texas A&M University in College Station, 100 miles northwest of Houston. Their 3-year-old daughter is also interred at the site. 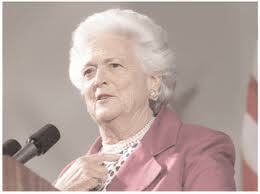 “`Considered the backbone of a political dynasty and a patriot, Barbara Bush was 92. This entry was posted on Tuesday, April 17th, 2018 at 7:11 pm	and is filed under Blog by Manny Pacheco. You can follow any comments to this post through the RSS 2.0 feed. You can leave a response, or trackback from your own site.